The challenge is to find STEAM in everyday life for 21 days this fall. This could be for a family or a classroom. Sign up here and you will receive 3 simple, no kit-required, ideas for STEAM activities for 21 days. These activities are fun for all ages. We respect your privacy. We do not share emails with anyone. It’s an acronym: Science, Technology, Engineering, Art, and Mathematics. It’s a great way of looking at the world and it’s also a set of building blocks for innovation and let’s not forget it’s a lot of fun! Why should you make sure that your family or your students have a healthy STEAM diet in their daily life? Here’s your chance to coach your kids on a healthier lifestyle, a lifestyle for the open-minded and curious! It’s also a lifestyle that will help them be more successful in whatever they choose to do. Just like you coach them on making healthy food choices, playing sports, or being a good person, you can coach them to be STEAM savvy. What better time than the fall to practice living a learning lifestyle. It’s good for the kids, it’s free, and it’s fun! Find the tallest object near you. How could you estimate its height? If it’s a building, encourage your child to think about what measurements they know. If there are a series of windows, for example, can they measure the height of one and estimate the height of the building? Discuss the idea that math is not only about precision but about estimation, using what we know so we can get a really good estimate. Here is a Middle/High School method you might like to try out too. What is the science behind “Hot pan, cold oil,” when sauteeing? If you don’t mind sacrificing some food, experiment with temperature of your pan and see what happens. To read a brief explanation, visit this site. Pick a pattern from nature. It could be from an animal or plant. Draw it. What shapes are used in the pattern? View some breathtaking patterns in nature here. Join us for the 21 day challenge! Sign up to explore the world around you in fresh, new ways. talkSTEM is a nonprofit organization. Its goal is to engage and to inspire. The STEAM daily challenge menu items were devised by the talkSTEM team, consisting of professional STEAM educators and including Dr. Koshi Dhingra, Founder and Director of talkSTEM. For even more perspectives on STEAM learning and teaching, visit talkSTEM.org. You can stay on top of the latest thinking in STEAM education and can sign up to receive the newsletter. The talkSTEM community consists of parents, teachers, researchers, entrepreneurs, STEAM professionals, policymakers and more. 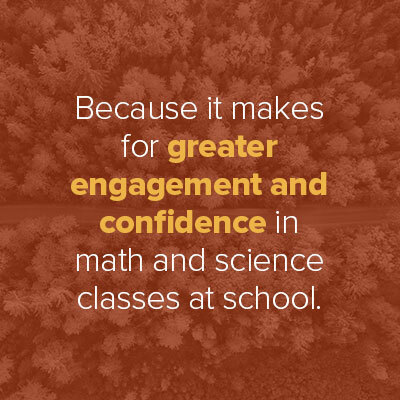 You can also learn about our exciting, new, interactive community program, walkSTEM, created in partnership with the National Museum of Mathematics. Included in your daily emails will be relevant short videos and blog posts by a wide range of educational experts on such topics as Art and Science, Talking Your Way in Science, Quiet Revolution in Schools, and more. We share these because we know that many of you will enjoy these perspectives but you do not need to view these in order to participate in the challenge. You will also receive links to curated content from a wide range of online sources that we love! Once you sign up, the blank calendar you will receive will be a useful way your students can keep track of their STEAM challenge. You can have them do the STEAM activities at home or at school. Feel free to make copies of and distribute the calendar to students so they can complete daily. Make it fun and have them share what they did each day. This can be a great motivation for kids! Don't forget to share what you do on social media. Use #21STEAMChallenge. We'd love to hear from you! 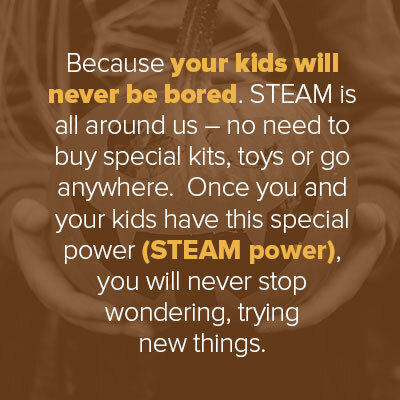 Help us share your STEAM activities so others can be inspired by what you did! Use #21daySTEAM and connect with us. Note: People have often asked us why we call ourselves talkSTEM versus talkSTEAM when we obviously include Art in our approach. We’ve always seen Art & Humanities as being tightly connecting to the STEM framework. Perhaps that’s why, when talkSTEM was founded in 2015, we did not feel the need to make this connection explicit by adding the “A”.